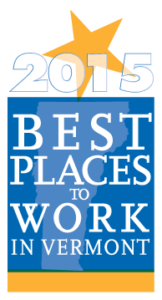 Union Mutual Fire Insurance Company was recently named as one of the 2015 Best Places to Work in Vermont. It marks the second straight year Union Mutual Fire Insurance Company has earned this distinction. The annual list of the Best Places to Work in Vermont was created by Vermont Business Magazine, the Vermont Chamber of Commerce, the Vermont Department of Economic Development, the Vermont Department of Labor, the Society for Human Resource Management (SHRM) – Vermont State Council and Best Companies Group. This statewide survey and awards program is designed to identify, recognize and honor the best places of employment in Vermont, benefiting the state’s economy, its workforce and businesses. The 2015 Best Places to Work in Vermont list is made up of 30 companies. The final rankings for each category were announced at a special awards presentation on March 26, 2015 at the ECHO Lake Aquarium and Science Center.